From the outset, The Five Doctors is clearly constructed more as a guest list for the twentieth anniversary celebrations than as a story in its own right. You can practically hear Dicks checking off the laundry-list of elements he was given by Nathan Turner and Saward. All four previous doctors? Check. Sarah Jane? Check. The Brigadier? Check. A Dalek? Sure, why not? The Master? Isn’t it starting to get a bit crowded? Gallifrey? Really? A Yeti? I’ll give you that one. The Cybermen? Do I have to? The entire production feels like a nice PR exercise, all built around the idea that certain things are part of Doctor Who and should be included, regardless of how they fit together or whether taste would be best served by omitting them. One wonders why a lone Dalek is wandering around Gallifrey, but the answer is obvious; you can’t have an anniversary without the Daleks. One questions the wisdom of including the First Doctor after the passing of William Hartnell; you can’t have an anniversary without all the Doctors. You can see why Steven Moffat has eschewed this approach when it comes to The Day of the Doctor, favouring story and the show’s integrity above marketing gimmicks or publicity hooks. Moffat is a writer who tends to be driven by story, so it makes sense for his celebration of the show to be driven by story. John Nathan Turner was more interested in the show’s profile and it’s public image, so it makes sense that his celebration is a collection of iconic imagery. That The Five Doctors makes any sense at all is a minor miracle, and it’s all down to how Dicks understands exactly what the audience expect from an episode like this. This isn’t going be some big “everything changes” story that re-writes what Doctor Who is about. It’s not going to be about a story that cuts right to the heart of the themes of the franchise. It’s not even going to reveal anything much of our hero’s already complicated back story. Instead, it’s going to be a collection of recognisable faces running around and having a good time. Anybody trying to make sense of The Five Doctors in the context of Doctor Who is doing it wrong – they’re fundamentally missing the point of the spectacle. This isn’t a great story like Carnival of Monsters or City of Death or The Caves of Androzani. Instead, it’s a “fun” story, one that wallows in the iconography of Doctor Who without being too bothered with the mechanics of how all this works. So the continuity is delightfully messy. There’s a sense that Dicks is having a bit of fun at the expense of Nathan Turner and Saward, and the more continuity-obsessed fans who like to fit things together perfectly. (This was the era when “super fan” Ian Levine worked on the show with the unofficial title “continuity advisor.”) Given that The Five Doctors follows an entire season built around sequels to old stories, the fact that The Five Doctors doesn’t really care about fitting in with the show’s history feels a bit pointed. As does the strange invention of Rassilon, a character who has gone on to become one of the cornerstones of Doctor Who lore. The character appeared in The End of Time played by Timothy Dalton, and in the Big Finish audio plays voiced by Don Worthington. 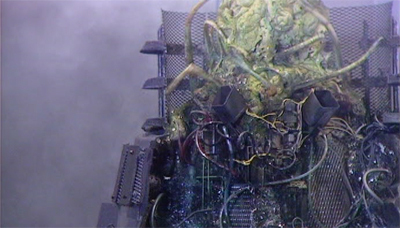 What is really strange is that the character of Omega would arguably have been a much nicer fit with the story, and a direct connection back to The Three Doctors. The strange similarities between Rassilon and Omega remain unremarked upon here, but went on to fuel a whole complex and speculative history of Gallifrey. It isn’t that Dicks or the show has forgotten about Omega. 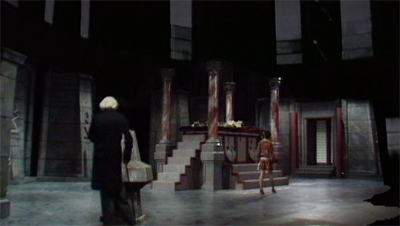 The character appeared in the first story of the twentieth season, Arc of Infinity, and Dicks has the Second Doctor make a passing reference to the character in conversation with the Brigadier. The use of an entirely new character who seems eerily familiar to one already established feels a little pointed. 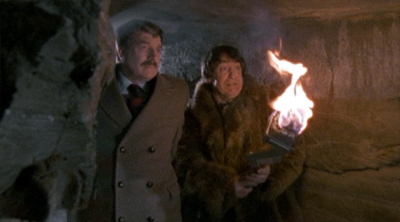 Of course, immediately after Jamie was returned to his own people at the end of The War Games, the Second Doctor was forced to change into the Third Doctor. So it makes no sense for a version of the Second Doctor to exist after Jamie’s memory has been wiped. Given that Terrance Dicks wrote The War Games, it’s unlikely to be a simple mistake. Instead, it seems like Dicks is drawing attention to the absurdity of trying to keep the continuity of Doctor Who straight. Not getting the joke, and building off more continuity-related nonsense in The Two Doctors, obsessive fans would latch on to the idea that there must have been a “secret” Troughton season that took place between The War Games and Spearhead from Space, proposed as “season 6B.” Dicks himself seemed to have a bit of fun with this idea in his novel The World Game. You’d almost believe that Dicks was spoofing that obsessive devotion to continuity, only to wind up provoking it to action. To be fair, part of the continuity mish-mash seems motivated by the fact that Tom Baker was unavailable.While that was undoubtedly disappointing to fans at the time – and led to the incredibly cynical decision to use Tom Baker’s wax work dummy in publicity shots – it’s arguably for the best. Baker would have dominated the story. 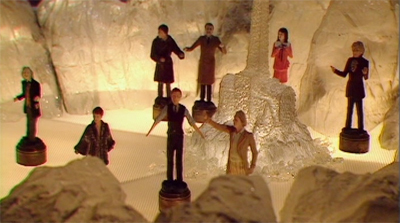 Dicks himself has conceded that his early story ideas for The Five Doctors centred around Baker, while the finished product is much more evenly split between the leads. Still, as a result of Baker’s absence, the pairings seem a little skewed. The Second Doctor visits the Brigadier at a big U.N.I.T. reunion, which feels a little weird given that the pair only met about three times before the Second Doctor regenerated. Surely it would be a later version of the character who would want to visit those sorts of occasions? The Third Doctor would arguably have been a better fit with the Brigadier. Which is entirely the point of The Five Doctors. It’s not about satiating rabid continuity obsessives who want everything to fit together quite snugly. It’s about providing a proud celebration of two decades of Doctor Who, trading on the franchise’s iconography. While it’s hardly a sustainable model for Doctor Who in the long-term, it remains far more satisfying than the slavish devotion to continuity and minutiae that plagued the rest of the Saward era. 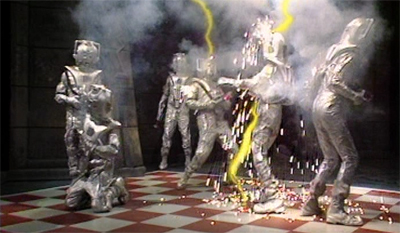 At least this is fun, if hollow; that’s more than could ever be said about Attack of the Cybermen. Unlike a lot of mid-eighties Doctor Who, it’s clear that Dicks intended The Five Doctors to be accessible to casual viewers. None of the Doctors or companions get too bogged down in who they are, or what they’re doing. Despite the fact that the opening clip is taken from The Dalek Invasion of Earth, Susan and the First Doctor act as if they see each other regularly – there’s no sense that time has passed, and no indication of what her life is like on Earth. As the first companion to leave the TARDIS, it might have been interesting to get some context for what she’d been doing, but the show glosses over it. Susan is here; that’s all you need to know. Even when dealing with unfamiliar elements, Dicks’ dialogue is clipped, but effective at bringing viewers up to speed. 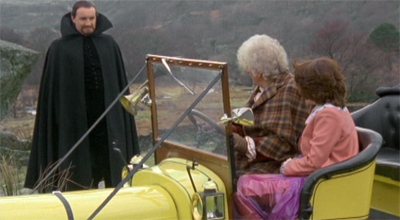 When Borusa explains that the Doctors are in “the Death Zone”, the Master handily explains, “Ah, the black secret at the heart of your Time Lord paradise.” That’s some gloriously stilted dialogue, but which conveys everything that the audience needs to know about what is going on. It’s worth emphasising that the characters who appear in The Five Doctors aren’t really the same versions of the characters that originally appeared in the show. The characteristics of these versions of the character have all been exaggerated and distorted by age. For example, Patrick Troughton plays the Second Doctor as more of an imp than he did during his time on the show; during his own tenure, Troughton’s Doctor seemed older than he did in The Three Doctors or The Five Doctors. 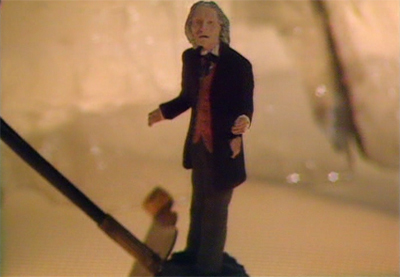 Similarly, the First Doctor is presented as a cranky old man. While this is undoubtedly one facet of the character, it ignores the fact that the character was actually much more playful and cheeky than he is presented here. 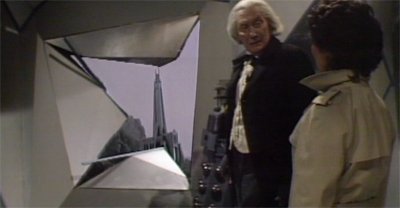 The First Doctor is presented as somewhat cantankerous, overlooking his propensity for jokes and his defining curiosity. It reinforces an image of the First Doctor that became more and more prevalent in the years since William Hartnell left the show. To be fair, Dicks is very clearly writing to nostalgia. He’s writing the characters as the audience remembers them, rather than how they really were. This is a very fitting approach to a twentieth anniversary celebration for Doctor Who, even if it isn’t entirely fair or honest to the work done by the performers. Dicks doesn’t get enough credit for his ability to understand what the audience wants from Doctor Who, and The Five Doctors is very much about giving people exactly what they would want. Of course, it’s easy to dismiss Dicks’ writing because it’s so clean and effective; this does the writer a disservice. After all, when Dicks is asked to write a multi-Doctor story, you get The Five Doctors. In contrast, when you ask the more accomplished Robert Holmes to write a multi-Doctor story, you get The Two Doctors. While I’d argue that The Two Doctors is a lot stronger than most people give it credit for, there’s no denying that The Five Doctors is a far stronger fit for the show’s big twentieth anniversary. And Dicks is remarkably self-aware here. He knows exactly what he is doing. When the First and Fifth Doctors meet up, there’s even a tea party in the TARDIS. The characters repeatedly draw attention to how ridiculous “the Death Zone” is as a concept. Dating back to early Time Lord history, the implication is that it’s an arena filled with death traps for the entertainment and amusement of those watching the people journeying through it. Which, in this anniversary special, is exactly what “the Death Zone” is. When the Doctor and the Master condemn Time Lord society for the barbarity of “the Games” and discuss their present situation, they come perilously close to realising that they are in an anniversary special. When the Cybermen ask the Master why they have been brought here, the Master explains, “To destroy each other for the amusement of the Time Lords.” If he replaced the words “Time Lords” with “the audience at home”, he’d be spot on. Similarly, when the Third Doctor and Sarah Jane talk about what is going on, it sounds as if Sarah Jane is questioning the script as much as the Time Lords. “But why don’t they just tell us why we’re here?” she demands. The Third Doctor explains, “Because they delight in deviousness, that’s why. It amuses them, chucking us in the deep end, watching us sink or swim.” It’s a crude but effective explanation for why Dicks would write that way as well; it also makes the whole thing a bit more suspenseful. It helps that The Five Doctors is really the only context where the pantomime version of the Anthony Ainley Master really works. The Master is a decidedly ridiculous and pathetic villain, even after destroying a significant portion of the universe in Logopolis. The character is a scenery-chewing ham who seldom has any stronger motivation than “he’s evil for the sake of being evil.” There are several points in the eighties when Ainley’s Master has schemes that don’t make any sense outside of comic book logic. So putting in him a battle royal with the Cybermen and the Doctor plays to the strengths of this version of the character. The fact that he’s competing against the Cybermen actually allows the character to seem somewhat effective. 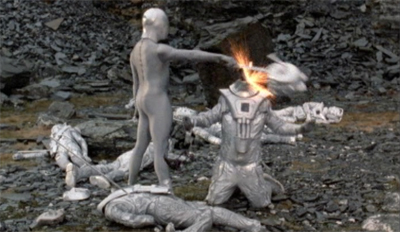 He brutally murders an entire platoon of Cybermen, which is probably the most efficient the character has been in year. Being forced to assist the Doctor rather than fighting against him allows the character to be on the winning side for a change. 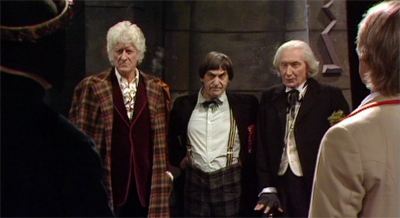 It’s worth noting that The Five Doctors is really the first time that the Master has seemed even vaguely sympathetic. We might have felt some pity for his burnt-out form in The Deadly Assassin, but he was still thoroughly and completely evil. 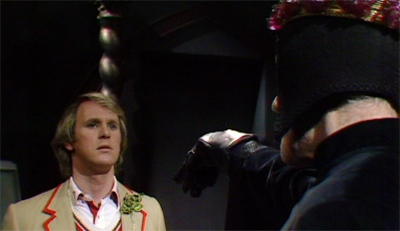 In The Five Doctors, the character is coerced into a life-and-death situation to assist the Doctor, only to discover that the Doctor (understandably) doesn’t trust him. He spends most of the special running around at the mercy of the Cybermen. This doesn’t excuse the character’s villainy, and it’s clear that he’s still a bad guy. After all, he has a black cape. However, it feels quite in line with the portrayal of the Master as a victim in Survival and the twisted and warped abuse survivor of the Davies era. Indeed, quite a lot of The Five Doctors has bled through into the new series. It’s hard to watch the brutal slaughter of the Cybermen in Doomsday without recalling their repeated humiliating dispatches here. Rassilon himself was the last concept revived by Russell T. Davies before his departure. The Five Doctors is far from the perfect episode of Doctor Who. Indeed, you could make a very convincing argument that it’s the sort of self-congratulatory nostalgia-fest that would lead to the classic show’s eventual decline and collapse. However, that ignores the fact that The Five Doctors was produced specifically to wallow in the show’s nostalgia, and that it wallows very entertainingly. 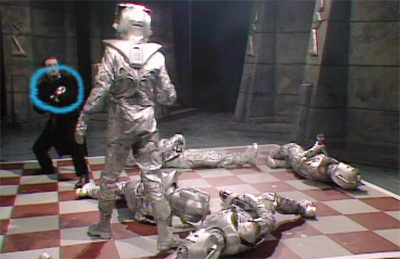 As much as the toxic continuity of stories like Arc of Infinity, Warriors of the Deep and Attack of the Cybermen poisoned the show, the problems the created were compounded by the fact that they were inaccessible and unwatchable. The Five Doctors is perfectly accessible and solidly watchable. It isn’t what Doctor Who should aspire to be, but it’s a fitting celebration. Just watched this with my two sons (11 and 9) as a warm up for Saturday’s special. 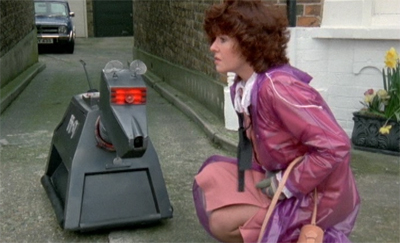 It still holds up and is a lot more fun to watch than most of 80s Who. It does exactly what it says on the tin.